Lock in a great price for Zamas Hotel – rated 9 by recent guests! 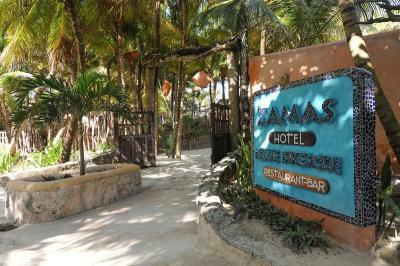 Loved the breakfast and staff at Zamas - very friendly and accommodating! 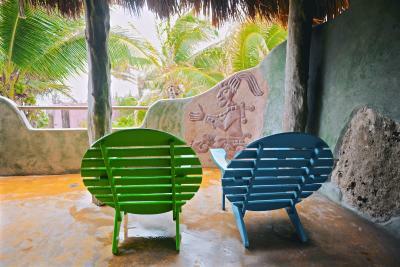 We had an ocean view from our upstairs room in the jungle garden and loved it. Very spacious room, clean. The staff was so kind. The room was much larger than I expected for the it's price. Facilities were perfect. I loved having the jug of water in my room opposed to the glass bottles. And BONUS! The Bug Repellent they give you is amazing! 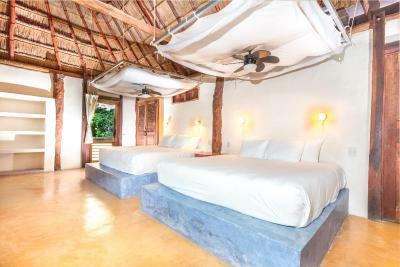 I didn't encounter any mosquitoes at Zamas but I did encounter some in Tulum in general and I used the Zamas Bug Repellent. The staff to us was the best part of our accommodations. They were friendly and informative. Loved our stay at Zamas. 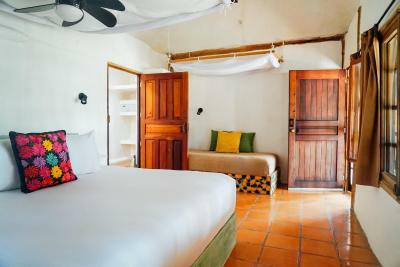 The staff was super friendly, the room was spacious and clean with a nice balcony, and the food was consistently great (we ended up coming back to Zamas restaurant several times vs others we tried even through we had those options). 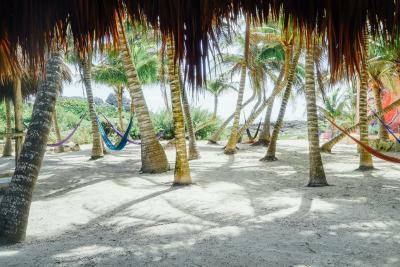 The area around Zamas is cool too, with a great vibe, lots of restaurants and bars, and you're a short taxi ride away from other Tulum attractions. Resort props has a nice location right on the ocean - great view and very relaxing. Everything! 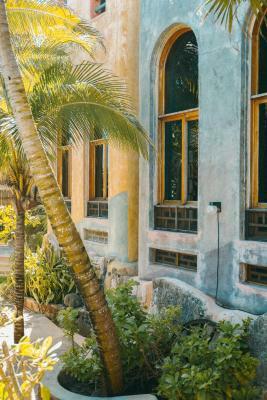 We had a wonderful stay at Zamas and didn’t want to leave! 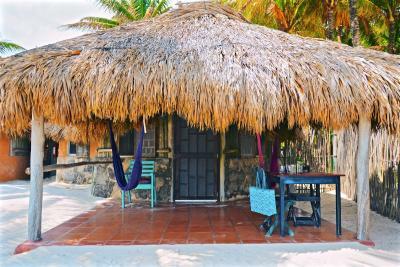 We stayed in a beachfront chica and while it’s definitely cozy it was perfect! I was honesty a little surprise how comfortable the bed was! Staff and service were fantastic and so were the food and drinks. We were really sad to leave and would definitely come back! If you want to unwind this is the place. 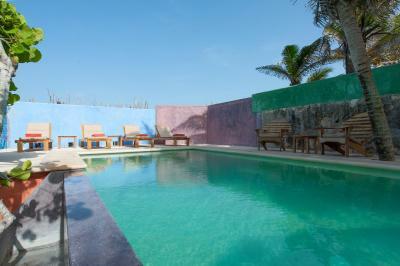 Get a beachfront room as the rest of the hotel is either behind the restaurant or across the street near the pool. 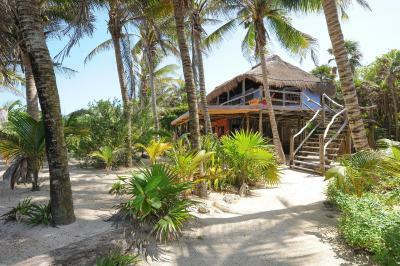 The staff are lovely, the restaurant is delicious and they will bring you breakfast to the beach in front of your room! The staff was so helpful, providing tips and making arrangements for us. The food in the restaurant is delicious. 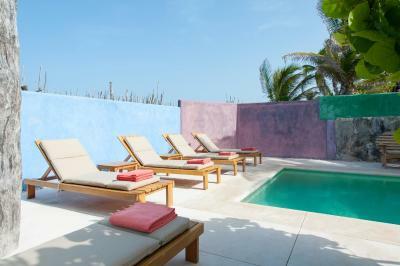 This is great value for Tulum! Food, drinks, service and stay were excellent - the location was fantastic and we felt so comfortable, and well taken care of. Highly recommend! We really can’t say enough positive things about the staff at Zamas - so welcoming, warm and accommodating! 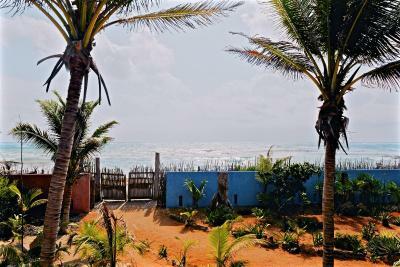 Awesome location, we never got a chance to stay so close to the beach, our room is like 20 ft from where the waves stop. We went as a family (My wife, 1-year-old and myself). Room was compact (couldn't get more on the beach room). Daniel was excellent in addressing what a guest needs. We like the food too. Zamas Hotel This rating is a reflection of how the property compares to the industry standard when it comes to price, facilities and services available. It's based on a self-evaluation by the property. Use this rating to help choose your stay! 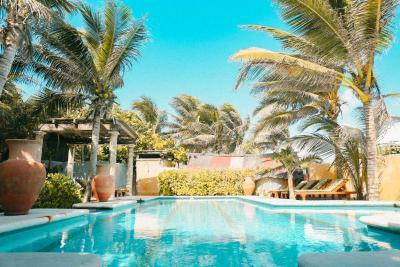 Located on a beautiful beach within Tulum National Park, Zamas Hotel offers an open-air restaurant, 24-hour reception and free Wi-Fi. 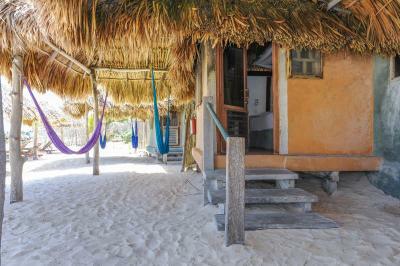 The colorful thatched cabins have balconies overlooking the tropical gardens or the sea. 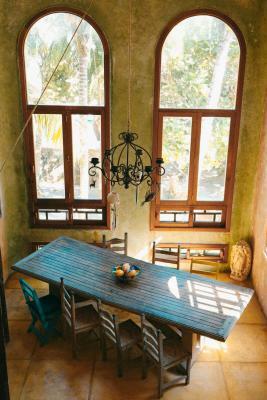 Each bright cabin offers stylish décor with charming rustic touches. 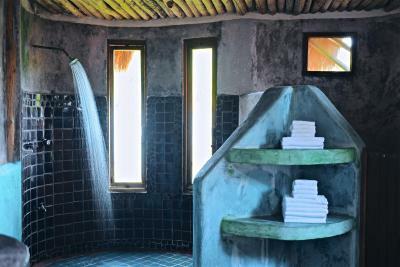 Mosquito nets and fans are provided, and all cabins have a private bathroom. You can relax in a hammock on the balcony. 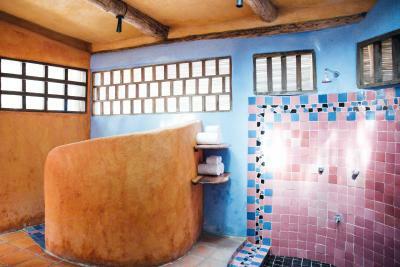 Massages and beauty treatments can be booked at Zamas Hotel’s reception. 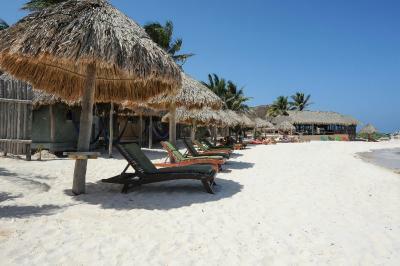 Staff can also arrange local excursions or airport transfers at an extra cost. 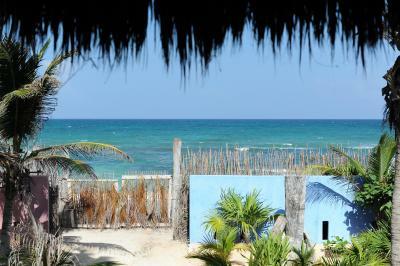 The Mayan ruins of Tulum are just 2.8 mi from Zamas Hotel, while the Sian Ka’an Biosphere Reserve is 3.7 mi away. 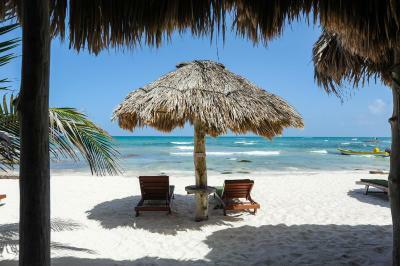 Cancun Airport is a 90-minute drive from the hotel. 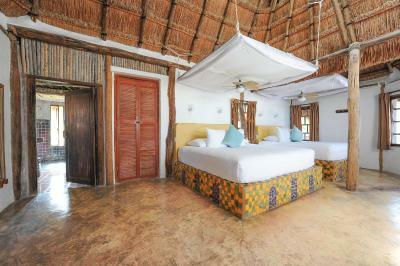 When would you like to stay at Zamas Hotel? 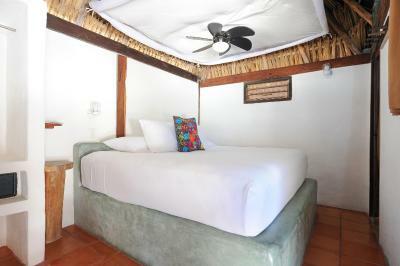 Offering charming rustic décor, this spacious cabin is surrounded by tropical jungle and has a terrace with hammocks. 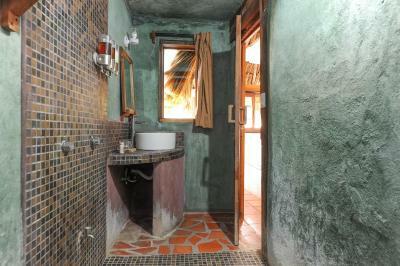 It offers mosquito nets, a fan and a private bathroom. 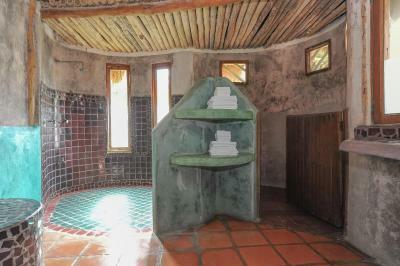 This room is located near the property pool and is ground level. This room has A/C. 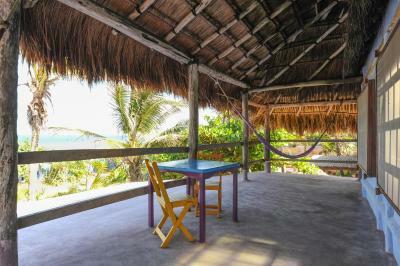 This colorful room is close to the beach and features a terrace with hammocks and partial ocean views. 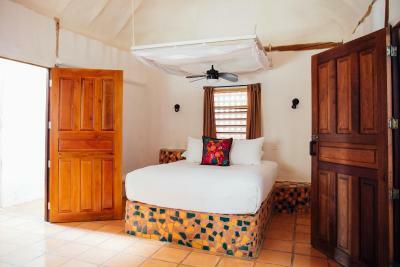 This room offers mosquito nets, a fan, and a private bathroom. 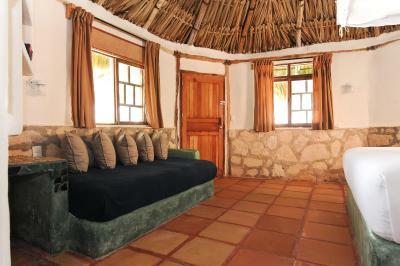 This room is located in the Coconut Grove. This room has A/C. 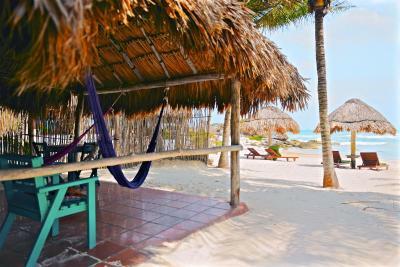 This room has views of the sea and has a terrace with hammocks. 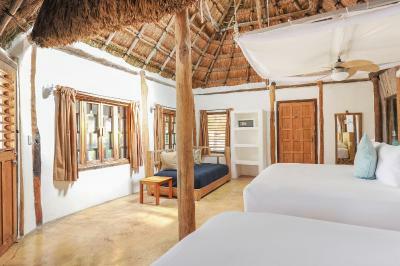 This room is located directly on the beach. 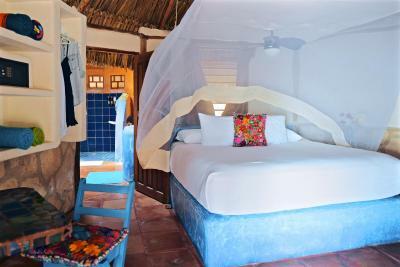 This room offers mosquito nets, a fan, and a private bathroom. This room has A/C. 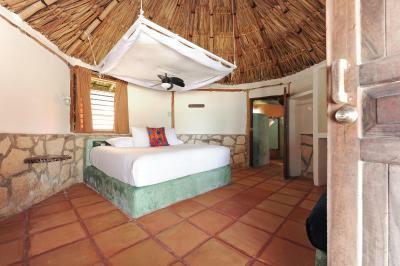 This room is located on the second floor and has a large balcony with hammocks and lounge chairs. This room has big sea views. 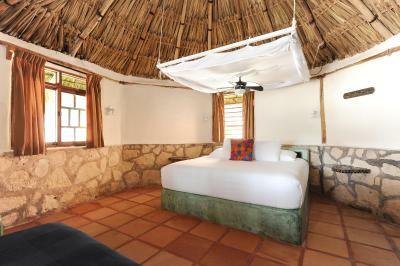 This room offers mosquito nets, a fan, and a private bathroom. 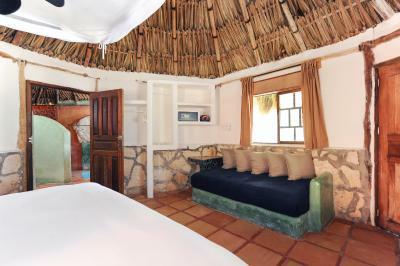 This room is located directly on the beach with views of the ocean. This room has a hammock. 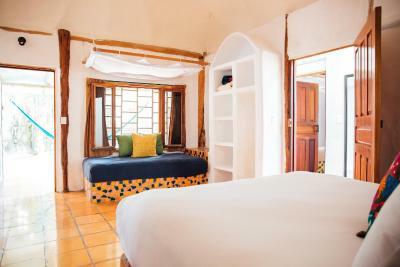 This room offers mosquito nets, a fan, and a private bathroom. This room has A/C. 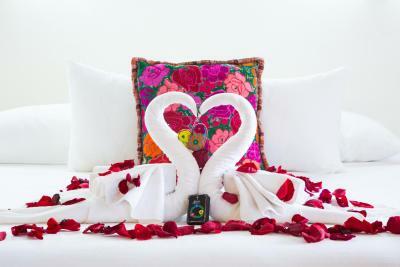 House Rules Zamas Hotel takes special requests – add in the next step! Zamas Hotel accepts these cards and reserves the right to temporarily hold an amount prior to arrival. Please inform Zamas Hotel of your expected arrival time in advance. You can use the Special Requests box when booking, or contact the property directly using the contact details in your confirmation. Think it is possibly starting to get a little tired in places but I believe it has been there much longer than a lot of the properties. Therefore very well established. 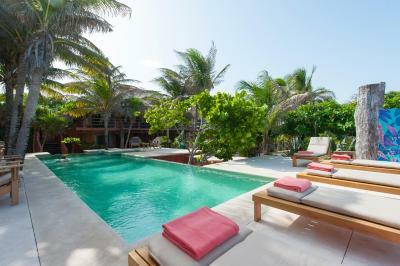 We would definitely stay there again and recommend to friends. 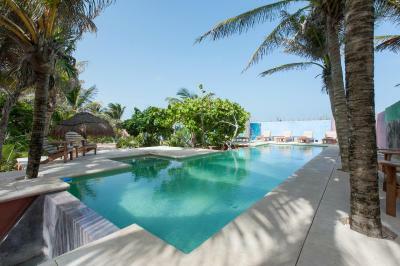 Great location albeit not on the main section of Tulum beach, but nice views. Our room was on the other side of the road but near the pool so our son was very happy, particularly as the sea was very rough during our stay! 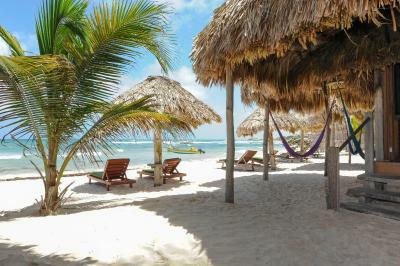 I think it was located in a quieter section of Tulum beach hotels which was nice. Restaurant was nice and staff were friendly and welcoming and really great with our son who is 8! Nice restaurants and bars in walking distance. On site car park. The swimming pool was on the other side of a busy road from our room - we didn’t realise this when booking. Also, food portions were quite small! 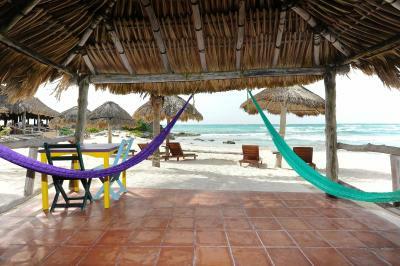 We liked the hammocks and the lovely big rooms! It was very relaxing, with lots of cool bars and restaurants close by. 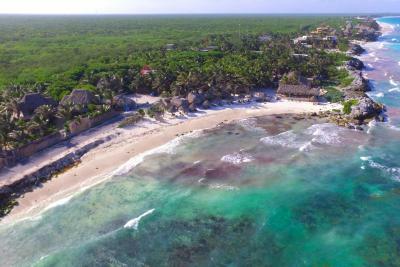 Much of Tulum has an issue with seaweed this time of year. Several beach clubs are removing it by the barrel all day. Zamas didn't remove any of it, which was unfortunate because we would have loved to hang out at the beach more at Zamas - but the smell of the seaweed made us go elsewhere. Breakfast was excellent. Ate breakfast here everyday, you can watch the pelicans fishing for sardines, v cool! The staff were excellent, loved the whatsapp room service! Room was huge and very clean, with free water and bug repellent etc. Right next door to a bicycle rental which we used for the 5 days as it is very quick to get into the busier part of tulum on a bike (5 mins). The staff were amazing, really helpful and friendly. 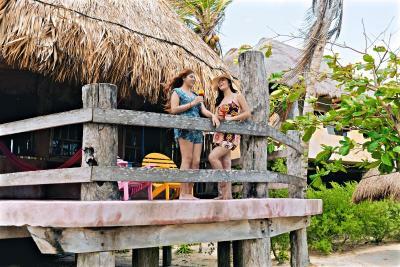 I stayed in a bungalow on the beach and it was stunning!! The room was clean and so comfy plus in the most beautiful setting. Highly recommended! 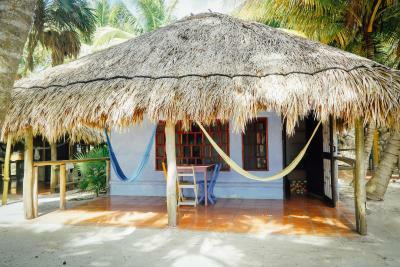 Although the bungalow was perfect on the beach and clean, the bungalows were a bit to small for us. Next time we would like to stay In the bigger classic cabanas which will allow us to have more space. The only reservation I had about our stay was the location of our "ocean view" room. We did indeed have an ocean view, and the room had a nice spacious balcony with chairs and hammocks - great for hanging out when you get tired of the beach. 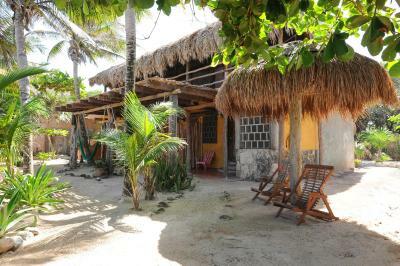 These particular bungalows, though, are immediately across the street from the main resort and the ocean. 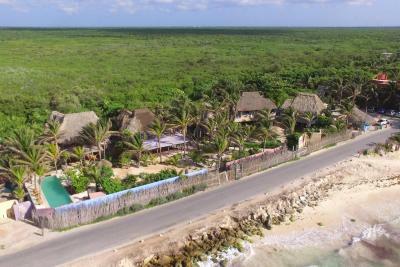 That being the case, there was some traffic noise as this is the main street that runs down the coast in this part of Tulum. However, even though I tend to be picky about that type of thing, I found that I didn't notice the traffic so much after a couple of days, and overall the place is very nice and we loved our stay. I would do it again even with that concern. With the size of the room, nice ocean facing balcony and great food and staff, I thought it was a great value for the money. Also, be aware that all of the resorts and beaches in this area have been having challenges with excess seaweed (see other online posts). Although annoying, this wasn't a deal breaker for us and we LOVED the area. The only things I didn’t like was the amount of seaweed buildup on the beach but Zamas cannot really control that. Every morning a hardworking crew was out removing some seaweed.